This entry was posted in Hi-Lo Offense, Offense and tagged basketball high low offense, coaching basketball on February 5, 2015 by admin. This entry was posted in Hi-Lo Offense, Offense and tagged basketball offense, coaching basketball on January 16, 2015 by admin. This entry was posted in Hi-Lo Offense and tagged basketball high low offense, coaching basketball on September 25, 2014 by admin. This entry was posted in A-Set, Hi-Lo Offense and tagged basketball a set offense, basketball high low offense, coaching basketball on September 9, 2014 by admin. This entry was posted in 1-4 Offense, Hi-Lo Offense and tagged basketball offense, coaching basketball on July 25, 2014 by admin. The High Post Offenses are the 1-4 High Offense and the 2-3 High Post Offense. The ATTACKING 1-4 HIGH OFFENSE is a tremendous offense to CRUSH pressure defense. It is perfect for the young point guard as he now has four entry passes to start the offense plus another entry shown in the book. The ATTACKING 1-4 HIGH OFFENSE can magnify any players ability that you choose to highlight!!! You the coach can control who gets the shots and where, while at the same time giving your better players the opportunity to “Make the Basketball Play.” The ATTACKING 1-4 HIGH OFFENSE is designed to attack pressure man-to-man defense but has also been very effective versus zone defenses. If your team is without a dominant post player and you need an effective offense to utilize the players you have, this section is for you! THE HIGH POST OFFENSE is a great offense, utilizing guards and undersized post players with great success and creates spacing, works against pressure defense, has many options, and is limited only by your imagination. Coach Jackson shows you his base set for running the offense, shows you the correct positioning, movements, and cuts. This entry was posted in 1-4 Offense, BOOKS, Hi-Lo Offense, Offense and tagged coaching basketball on May 22, 2014 by admin. 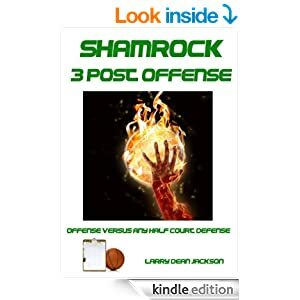 If your team is without a dominant post player and you need an effective offense to utilize the players you have, this book is for you! The High Post Offense is a great offense, utilizing guards and undersized post players with great success and creates spacing, works against pressure defense, has many options, and is limited only by your imagination. Coach Jackson shows you his base set for running the offense, shows you the correct positioning, movements, and cuts. This entry was posted in BOOKS, Hi-Lo Offense, Offense and tagged coaching basketball on May 20, 2014 by admin. This entry was posted in Coaching, Hi-Lo Offense and tagged basketball high low offense, coaching basketball on May 16, 2014 by admin. This entry was posted in Hi-Lo Offense, Motion Offense and tagged basketball high low offense, basketball motion offense, coaching basketball on May 7, 2014 by admin. This entry was posted in Hi-Lo Offense, Offense and tagged basketball offense, coaching basketball on May 5, 2014 by admin.